In this show, we discuss recent briefings we received from CloudGenix, Light Cyber, VMware, and Meru. We also go on a little rabbit trail about Brocade, because they came to mind. You know how we are. While Packet Pushers were covering the Barcelona HP Discover conference and we got together with some of the folks attending the event on the show floor. The result is non-coherent discussion about whatever topics each person wanted to raise and discuss. Neil Moore is the first and only 8 x CCIE in the world. Neil shares his CCIE preparation tricks, study methodology and many other important points. The Coffee Break will be renamed to the “The Network Break” and will be getting its own channel on the Packet Pushers Network. But for this week, we talk about the latest news in networking and physical infrastructure. In this first part of the Multicast Design and Deployment Series, Orhan Ergun talks with Mr. Multicast Beau Williamson about many multicast concepts. They both start from the basic and deep dive many multicast concepts while giving real life examples. Health week on the Coffee Break – we are drinking water instead of coffee or kool-aid. Everything else remains the same. This is “The Coffee Break”. A podcast on state of the networking business where we discuss vendors moves and news, analysis on product and positioning, and look at the business of networking. In the time it takes to have coffee break. News of the Networking Industry in the time it takes to drink a coffee (more or less). This week we are joined by Amy Engineer to parse the news and dig into the business of technology. Our attendance at the Open Networking Symposium promotes a discussion of events there. Mike Fratto joins us this week to talk about the news of the week on IPv4, Broadband Performance, Net Neutrality, IBM, SDN and more. This is “The Coffee Break”. 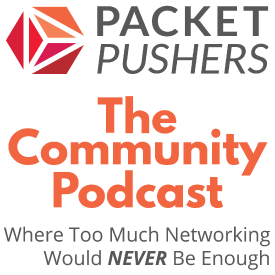 A podcast on state of the networking business where we discuss vendors moves and news, analysis on product and positioning, and look at the business of networking. In the time it takes to have a coffee break. This is “The Coffee Break”. A podcast on state of the networking business where we discuss vendors moves and news, analysis on product and positioning, and look at the business of networking. It’s like a soundtrack for the network industry. In the time it takes to have coffee break. Or so. A place for anyone to start a podcast with the Packet Pushers.